1. Press the Home key. a. Automatic brightness - tap the checkmark next to this option to let the device adjust brightness automatically. b. Brightness level - remove the checkmark from the Automatic brightness checkbox, for you to set a custom brightness level by simply touching and dragging the Brightness level. 6. To save the settings, tap OK.
a. Press the Home key. e. Tap Screen timeout to select a time period you want. 5. Tap on Touch key light duration and choose a duration period you want. a. 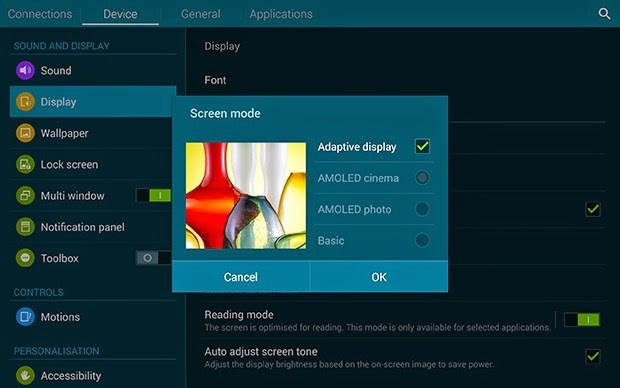 Adapt display - use this option to enable or disable automatic optimization of the screen to match the type of image being displayed and other criteria, including battery level. To enable this feature, put a checkmark on the box. b. Disable Adapt display to select a specific screen mode to match the content you display. 5. Tap the ON/OFF switch next to Reading Mode. Doing so will turn the option On or Off. Once it is enabled, tap Reading mode to select applications that will use this option. 5. To enable/disable the option, tap Auto adjust screen tone. 5. Tap the ON/OFF switch next to Multi Window to enable or disable the option. You can configure the Daydream setting on your Galaxy Tab S, to control what screen displays when the phone is docked or while charging. You may choose to display a Colors screen, or display photos stored on your device. Follow these steps to learn how to use Daydream feature on your tablet. a. Colors - this option lets you adjust color by tapping the selector to enable or disable display of a colorful screen. b. Flipboard - this option lets you display photos from Flipboard. To choose photos to display after enabling Flipboard, just tap on the Settings icon (represented by a wheel-like image). c. Google Photos - this option is used to display images from Google Photos. d. Photo Frame - to enable or disable display of photos in a photo frame, just tap the selector. When enabled, you can tap the Settings icon to choose pictures to display. e. Photo Table - similar to Photo Frame, just tap the selector to enable or disable display of photos in a photo table. When enabled, you can tap the Settings icon to select the pictures to show. 6. To switch to daydream, tap Start Now or tap Select dream time to select when daydream shows, from While docked, While charging or All. 5. Tap Auto rotate screen to enable or disable the feature. 5. And to enable or disable this feature, tap the Show battery percentage label. When enabled, the Edit after screen capture will let your captured screens to display automatically, allowing you to add a note on them. Follow these steps to enable this feature on your Galaxy Tab S.
5. And to enable or disable the option, tap on Edit after screen capture. And that how to manage display settings on your Samsung Galaxy Tab S.